The Skylink SC-1000W is a do-it-yourself friendly wireless security system designed for home users who wish to protect their homes by self-monitoring via telephone rather than paying monthly monitoring fees. When the alarm is triggered it will call up to 9 telephone number(s) and play your pre-recorded message to notify the homeowner, friends or family of the emergency. Installation and programming is very simple and user friendly making it perfect for anyone. 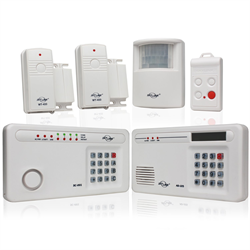 The SC-1000W kit includes the main alarm system keypad which is generally mounted near the entrance location and needs only access to power. This keypad is the 'main brains' of the alarm and also houses the loud siren. An additional external siren can be added. The second piece is the dialer that can be hidden away and connects to the home phone line. During an emergency the main alarm unit sends a wireless signal to the dialer instructing it to call the programmed number(s). Since the dialer can be hidden away from the main keypad, it's protected from casual disabling. 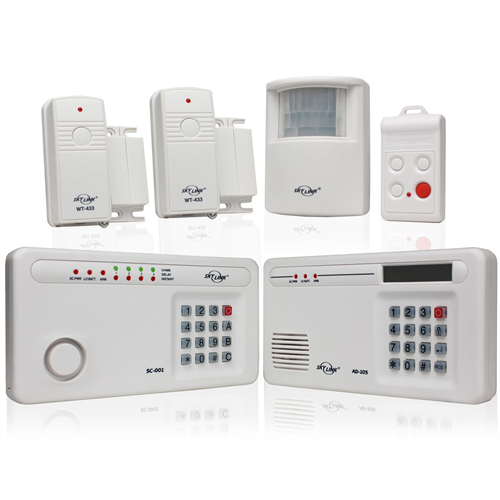 Additional wireless detectors, keyfobs and sirens can be added for extra coverage and function. Additional sensors include door/window sensors, motion detectors, water/flood detectors, temperature sensors (good for cottages), audio sensors (detect smoke alarm or other house alarms). Kit includes control panel, dialer, 2 x door/window sensors, 1 x motion sensor, 1 x key chain remote, batteries, instructions, power supplies.